Thanks to its intuitive interface and outstanding natural-language event-creation capabilities, the original version of Fantastical for the iPhone has been the rare static icon on my otherwise continually evolving Home screen. Put simply, it’s a much better calendar than Calendar—at least for my needs. But much like Apple’s own iOS 6-era apps, the original Fantastical’s font choices, muted colors, and skeumorphic details—such as subtle “stitching” along the top of the virtual calendar—look dated on a phone running iOS 7. So it only makes sense that Flexibits, the maker of Fantastical, has been working on a new appearance for the app. But the company has also been developing new features that have required significant changes under the hood. When you launch Fantastical 2 for the first time, you’re asked to allow it to access your calendars and reminders—a standard procedure in iOS 7. (Any calendar you’ve configured in iOS 7’s Settings app should work with Fantastical.) You’re then greeted with the same basic view you’d see in Fantastical 1: A red title bar indicating the current month and year, with buttons for accessing settings and creating a new event. Below that is a white calendar showing, by default, the upcoming five days—as the first-launch tutorial helpfully explains, you just swipe down an inch or so to toggle between this view and a monthly calendar. (Scroll a little less, and you get a search field for searching all your calendars by event title, location, invitees, or all.) Taking up the rest of the screen is the Day Ticker, a scrolling, chronological list of the events in your calendar(s), with past events dimmed. But while Fantastical 2 functions much like its predecessor, it’s immediately obvious that this is an app that takes its design cues from iOS 7. The colors are brighter, the fonts are thinner, the contrasts are starker, and, to use an overused word, everything looks flatter. The little skeumorphic effects have also been eliminated. For example, the virtual stitches are gone from the top of the calendar, and whereas the selected date was previously “circled” in red marker, it’s now called out using a simple black circle. Fantastical 2 also supports iOS 7’s Dynamic Type feature, so text adapts to your systemwide size setting. Whether or not you like the new look will be closely aligned with your opinion of iOS 7, but Fantastical 2 fits right in. As before, to create a new event you tap-hold anywhere in the calendar view, or tap the plus-sign (+) button in the upper right; you then begin typing a description of the event in everyday language—or even an abbreviated version of it. (Fantastical 2 understands English, French, German, Italian, and Spanish.) Typing Lunch with Jon Monday at Amici’s results in an appointment called “Lunch with Jon,” scheduled for Monday at noon, with “Amici’s” as the location. Typing Staff meeting every Monday 1030a on Phone gives you a repeating event titled “Staff meeting” that occurs every Monday at 10:30am with “Phone” as the location. Tapping Show Details displays a more traditional set of event-entry fields. This view is useful in cases where the natural-language feature isn’t accurately recognizing your description; you need to provide additional information such as notes or a URL; you want to manually tweak event details; or you want to invite other people to your event. The recurring-event options here aren’t as flexible as those offered by, say, Readdle’s Calendars 5, but you do get more options than with the built-in Calendar app. 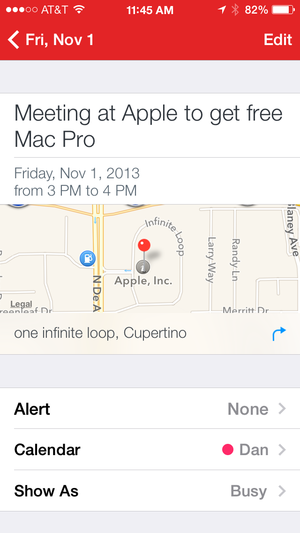 Whichever approach you use, tap Save, and the event is added to your calendar and appears in the Day Ticker. Deleting an event is as simple as left-swiping over it in the Day Ticker and tapping the Delete button that appears. 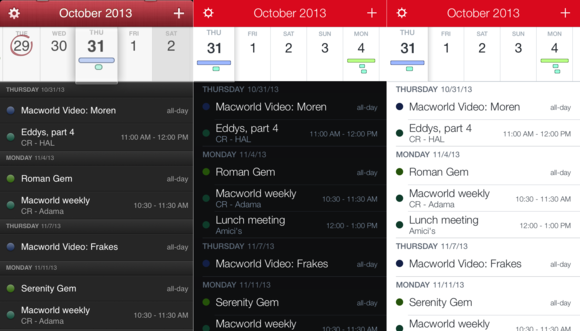 Fantastical has always unabashedly been a list-view calendar app. Though the month and five-day calendar previews indicate which days have events scheduled, those views are primarily a way to see, at a glance, which days are busy or empty. The app’s focus is instead on the detailed, scrolling list of upcoming events. 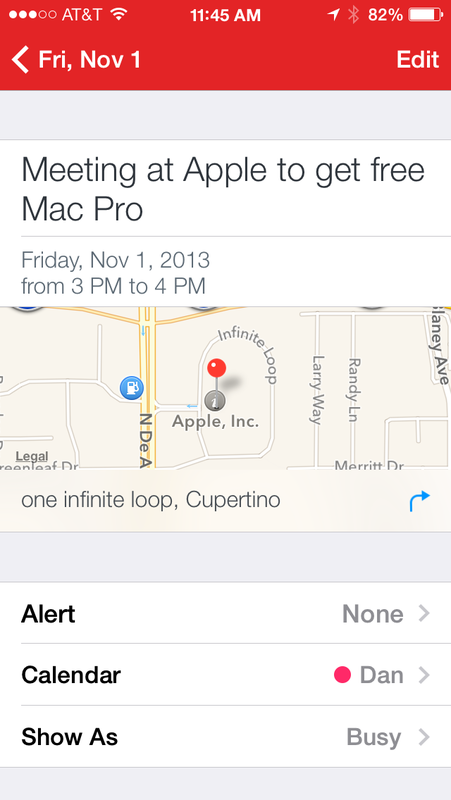 But with Fantastical 2, Flexibits has responded to customers who’ve asked for a traditional calendar view. Rotate your iPhone to landscape orientation, and Fantastical 2 switches to an attractive week view of your calendar. This landscape calendar shows only five days, but it provides a scrollable, eight-hour view of those days, with event details that are large enough to actually read. You can scroll up and down to shift the visible time range, and scroll left and right to change the viewed dates. Tapping the month name in the upper-left corner takes you to the current date. As with the main calendar view, you can tap an event here to view its details or edit them, and you can tap-hold on a date to create a new event. But there’s a nice extra here: If you tap-hold on a particular time—say, Tuesday at 2pm—the new event’s time is automatically entered for you. 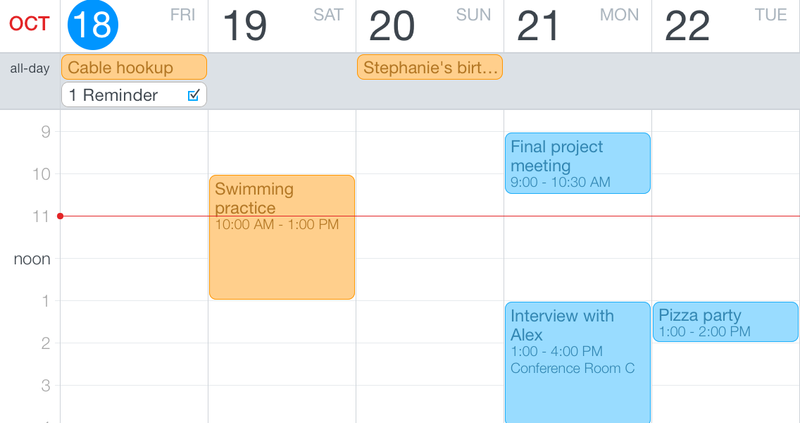 Fantastical 2 also takes advantage of iOS 7’s new Background App Refresh feature to automatically check for updates to your calendars and reminders. This is a big improvement, as anyone who has used a third-party calendar app in iOS 6 or earlier knows all too well: You would open your calendar app and have to wait for a (sometimes slow) update to make sure you were seeing the latest changes; or you’d receive outdated calendar alerts for events that had been modified or deleted. In Fantastical 2, your calendars are always up to date within the app, and your alerts and reminders are accurate, even if you haven’t opened the app for days. If you tap-hold an event in the Day Ticker, you get a popover with options to duplicate, move, and—new in version 2—share the event. Duplicating obviously creates a duplicate copy, but a nice touch is that Fantastical immediately prompts you to enter the start date and time for the duplicate, since what you usually want to do is create another instance of the event but at a different date and time. The Move option presents a date/time picker to move the event to the desired date and time. And the new Sharing option creates a new email message with a .ics calendar-event file as an attachment, so the recipient can easily add the event to his or her own calendar. On iOS devices with four-inch screens (the iPhone 5, 5c, and 5s, and the latest iPod touch), Fantastical’s keyboard now offers an extra row containing numbers and the / and : symbols, making it easier to enter dates and times when creating events. And on all devices, a new Light theme inverts the Day Ticker’s colors to black text on a white background for those who aren’t fans of white text on black. Fantastical 2, like its predecessor, doesn’t try to be the end-all, be-all calendar for everyone. Though the new version does add a useful landscape-orientation week view, Fantastical remains primarily an app for quickly viewing your current and upcoming events and tasks, and for making it as easy as possible to create and edit those items. But it excels at these goals, and the new features fill in several of the original’s gaps, making the app more capable while remaining easy to use. Fantastical 2 improves on an already—I’ll say it—fantastic app. The outstanding calendar app maintains its intuitive interface and natural-language-event-creation capabilities, but gains reminder management, a bunch of new features, and an overhauled interface.